Since this blog post, the 10-year Treasury yield has fallen, which has put the TLT (below) close to breaking its downtrend line (price, not yield) in place since early 2015. Not being a trained technician and more an armchair observer, does this chart represent a head-and-shoulders pattern ? 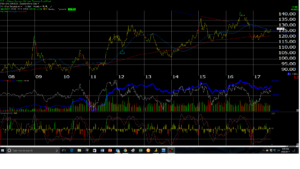 Either way, it looks like the TLT is poised to break above this downtrend line. The chart of the Transports has been on the verge of breaking down for a few weeks now, but the bond market and particularly Treasuries have frustrated for years. Owning high yield or investment-grade credit looks to be a poor risk-reward. With the hike in the fed funds rate to 1% – 1.25%, clients own Treasury bills and money markets now, and little duration or credit risk. To be frank with readers, this call has been wrong for many years. Inflation seems non-existent. Last week, with the Thursday morning jobless claims release showing just 232,000 in initial jobless claims, and near multi-year lows, the Treasury market didn’t budge. Transport’s have been close to a technical breakdown for many weeks. Another rally in the 10-year Treasury yield through 2.13% and a breakout in the TLT would not be well received in the equity market in my opinion.